Gosh I feel like this is definitely one of those ~"courtesy of"~ blog posts which I personally really dislike. I'm all for a bit of product placement within the blogging industry, I get why it happens and how it benefits brands and bloggers. But If I'm honest, I personally really don't really enjoy blogs where almost every item is gifted. I feel it takes away from the personal element a tiny bit and I can't put my finger on why it rubs me the wrong way so much. Even from a blogger point of view who regularly gets offered stuff I find it tedious seeing it, so I have no idea how it looks to people who just read blogs. Mini ranty blogger rant over. The outfit. I kept it simple with a huuuugeeeee massssiiiiveee overrrriszedd tee from ASOS, my ol' faithful american Apparel leggings and a recent addition to my wardrobe this pleather and denim jacket from Misguided. The ever so lovely Sara said I could pick a few items to style and this was one of them I knew I just had to get my grubby hands on. I think the mixture of denim and pleather sits really well together and gives it a bit of an edge to a pretty boring outfit! Also pulled out my River Island Flatforms today, I haven't worn them in a while in favour of my beloved Alvin's but I forgot how nice they look on. I think they really flatter my figure and my legs! Thought I'd include the video I filmed earlier as well as it's the same outfit so you can kinda see it moving a bit! I added the necklace later as it felt a bit plain without it! Commenting for the title <3 and you're a babe, obz. Much love Melrose 2k12. The title, the song, the outfit, it's all perfect. Love the jacket and your outfit! Love how you styled the jacket w/ the constrasing sleeves! I have a similar jacket from Zara, love it so much. Great outfit I really like the shoes!! Omg this jacket is so amazing! Fierce look! Reeeaaallllyyy love this outfit!! The jacket is amazing! what size is the jacket ? your style is exactly what I love! that jacket is so so so nice! :) also I agree with you about finding it annoying when some bloggers outfit posts are bombarded with gifted items all the time! Loved the outfit when I watched the video! 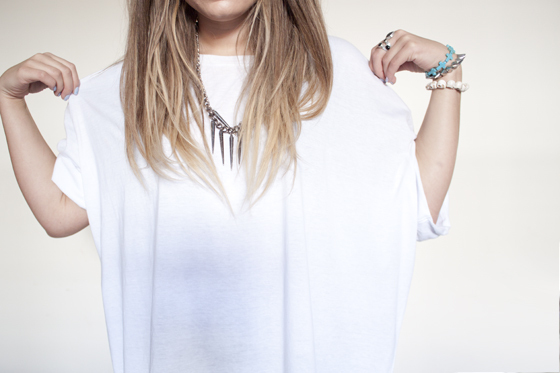 love this tee Lily, so much so i now really want it, BIG love for oversized t shirts! looking fab as always darl! Lovely outfit, The shoes are lush! That jacket is so fabulous! Reminds me a lot of that military + leather one that Zara had recently. Also I just did a blogpost with the most amazing leopard coat I thrifted! Take a look, I hope you like it! Definitely was just talking to my mum about that exact rant a few days ago... So annoying to me! 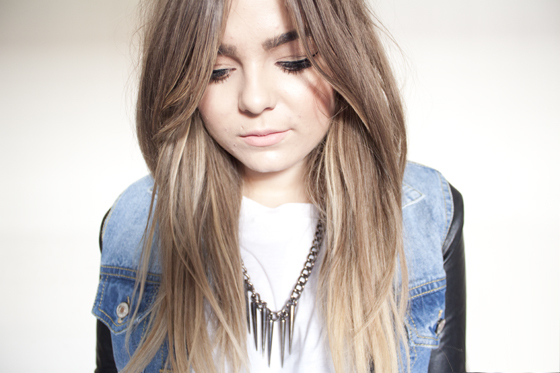 Oh my goodness, I am absolutely in love with this outfit even if it is an oversized tee! amazing outfit! always love your style! and the videos cute too. love the textile contrast of the denim and leather! really love the white top... such a nice basic! it looks really pretty love the jacket ! I love your blog, girl! 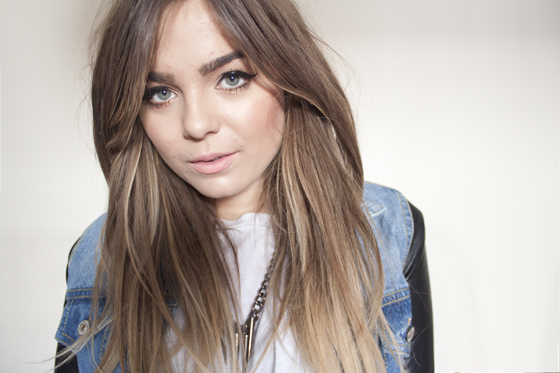 Your voice in the video blog's is so cute! I'd never have thought to team those leggings with flatforms but it looks absolutely gorgeous! Love the denim/leather jacket too. As I only ever seem to wear either my denim of leather jacket, I think I should buy this for the days when I can decide between the two! I love this outfit you look amazing. Очень стильный look. Вы меня вдохновили, я прям сейчас сделаю такую куртку. Спасибо. 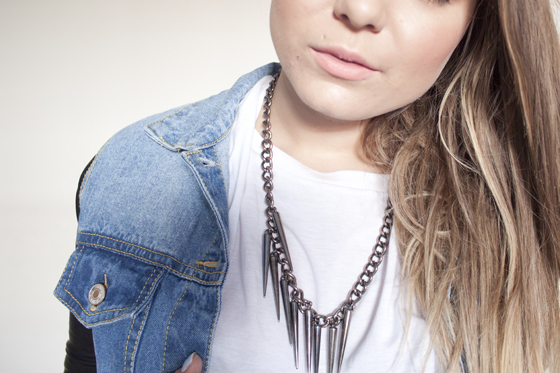 The necklace adds just the right amount of boldness, looks great! Really cool outfit! i love reading your blog, compliments and keep going! to be honest (and this coming from someone who's never received anything "courtesy of...") i don't really mind when bloggers showcase many gifted itmes in their blog :) because i still think that they incorporate the things into thier style, and you are a great example for that! everything you wear looks so much "you", i think you just make it yours by styling and combining it your way :) so don't worry, i for one don't mind seeing these kind of posts! I love your outfit! Can't wait to watch your Favourites video! Love your style.Your nail polish,bracelet,necklace,lips,jacket everything is awesome !! i love this outfit! this jacket is so cute! Also, your attitude towards "courtesy of" posts is so refreshing, one of the reasons I love your blog so much!